bump to help generate interest? Caldazzar is a simple, direct god worshipped primarily by metallic dragons who values righteous strength and courage above all things and destroys his enemies in his holy, cleansing flames. He believes in the inherent superiority of the draconic race and defends them and fights for them (particularly his favoured children, the gold dragons) when their prodigious strength is not enough, appearing as a flaming whirlwind of destruction, roaring his fury and bellowing laughter as he slays his foes. He would give his immortal life for his favoured children if needed, for they are the epitome of what he believes and must be protected. He is, however, reckless, with a tendency to charge in against seemingly overwhelming odds, and he has little time or respect for those who he sees as weak or deceitful. Caldazzar was once an immeasurably powerful, ancient gold dragon whose fervour and commitment to his people caught the eye of Bahamut, who saw in him a force for good and justice, albeit a wild, untamed one. Bahamut, taking the form of a radiant platinum dragon, appeared before Caldazzar and challenged him to a bout, a contest of strength and endurance, thinking to test his true strength and resolve. Laughing uproariously at the thought of testing his mettle against one of the gods Caldazzar attacked without hesitation. The two dragons battled back and forth for three days and three nights before, at his very limits, Caldazzar was finally struck down. Bahamut, in one final test of Caldazzar's commitment, then, exhausted himself despite his deific power, brought forth a young gold dragon, unleashing the full might of his breath weapon at the young creature. Heaving himself upright Caldazzar, cursing the god for his treachery, threw himself in the path of the cold flames, fully prepared to die to protect the youngling... The flames passed harmlessly over him. Had he thought more clearly he would have known that Bahamut, just, true Bahamut, would never have harmed a child like that, but Caldazzar had never been one for thinking his actions through. Impressed by his self-sacrifice and strength Bahamut returned to Mount Celestia and brought Caldazzar with him, elevating him to the status of demigod. Since that time Caldazzar has been worshipped by the good, metallic dragons, primarily the gold, as a god of battle, courage, strength and fire, imbuing his followers with a love of fighting, a need to decimate their enemies with cleansing flame, and a desire to protect their people. Or at least he did; very recently the prayers of his worshippers have gone mysteriously unanswered and his joyous roar has been strangely absent from the outer planes. Last edited by AHrimel; 02-03-2019 at 03:42 AM. 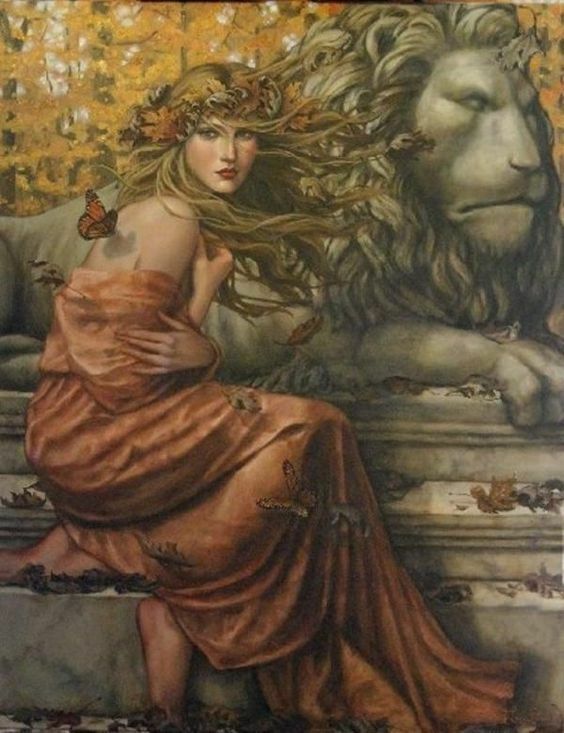 Domain: I am the Goddess of Childbearing and Motherhood, of Home and the Hearth, Healing and Defense. I bleed for the downtrodden and the weak. I cannot easily see a cat hurt, let alone a child, and will rush to the defense of both. I enjoy delights of the senses. Food, wine, stories, music – and other things perhaps a bit more intimate. The innocence of children and sacred places are more important to me than an Empire or a Library of 10,000 irreplaceable volumes. Unless pushed, I get squeamish doing what needs doing. When pushed, I will walk over a civilization of corpses. I don’t much care for book learning. Though I admire the smart and trust in knowledge, the cogitator, the over-thinker finds me slim on patience. My gold hair remains, though rusted. My body lacks strength in ways I can barely articulate but cry in frustration to feel. If this is the way of mortal adults, how much weaker are the babies than I ever imagined. I am slim still, and fair of both complexion and in terms of beauty. I am like those silly paintings my worshipers used to make of me. I’d always found them silly and short, half-again as useful as admiring a baby girl. And now? Now I wish I had half-again as much permanence. Note Bebinn is one of the Goddesses of a Pantheon I created. The others my 'Legend' mentions are from the same pantheon, as is the mythology and the cosmology it implies. Obviously I don't expect that your world will work the same as mine, and if we have to change her history a bit to fit within you're world, please know that I'm happy to do so at your leisure. The Hearth Mother is one of the oldest deities and has a long history, one that touches every other deity. She is also one of the most powerful, as birth speaks with force and frequency rivaled only by death. Sometimes they speak simultaneously. Those are generally bad days. There is probably no one with whom Bebinn as more history than Sabine, the Goddess of Trickery and Secrets, Illness and Jealousy. The Hearth Mother’s dearest enemy is The Old Crone, and they have battled across the heavens for Millennium. One story has it that they were once allies, though. It’s said that The Old Crone was once part of The Twin-Fates. To Incidence and Permanence, she was Evanescence. Everyone knows part of the story. Thimalsus was a Priest to The Hearth Mother, ministering to the dispossessed. Out upon the earth one day in a howling storm, Thimalsus met a young woman four months pregnant, and he met her man. They were unmarried and fleeing from her father, who threatened to crucify and disembowel the young man. This was Madeline and Lorenzo, and Thimalsus led them to safety. In fact, he lead them to The Labyrinth of the Tuatha de Danann. They escaped into its infinite enclosure and Thimalsus waited to misdirect her father. But that was a secret and Evanescence (then called) felt as if Thimalsus was trying to give something to her sister (permanence) something that she herself was owed. This relationship, she insisted, was not meant to last. And so she told the Lady Madeline’s father where she was and who stood in his way. Lucas, Madeline’s father, came before Thimalsus and demanded the runaways. Thimalsus stood his ground, asking what the father planned to do with the woman, her child and her man. The woman, Lucas’s daughter, was to be spared. She would be punished, but she was his flesh and blood and would live. Of the man Lorenzo, the father was completely plain. He would disembowel the man, after he tortured him on the vertical rack of crucifixion. Of the child, he wouldn’t speak much. He said they’d ‘induce’ the child. Thimalsus asked if they had a nurse, a witch, a creature of healing magic with them. They did not. Thimalsus knew what ‘induce’ meant in that case. He would not stand aside. There is a reason why Thimalsus is now known as the Thrice-Tortured. Lucas hanged him first, lifting his feet for moments of brief relief. Just before he was truly to suffocate, Lucas cut him down. Then he castrated him, making the then twice-tortured eat himself. Finally, Lucas disemboweled this man, intent to hang him by his own entrails. But Lucas had drawn out his fun too long. And Thimalsus had endured so well. Madeline and Lorenzo had found the Heart of The Labyrinth of the Tuatha de Danann where hides the sparks for all the divine. They grasped it and in a rush, raised themselves to Godhood. They punished Lucas but being new in might, could not find the power to save Thimalsus. Bebinn came to earth then. She touched the face of mortals, crying for Lucas and his gory rage. She honored Thimalsus there, and with power never seen before or since from a God, raised another to Godhood herself. Thus we call her the Allmother. Characters: Bartholomew Orthis, of Priestess. DMing The Great Exile. Question: are all players going to be from the same pantheon, in the end? Would they recognize one another, if that is so? Class: Sorceror? Possibly Rogue(Assassin) or some combination thereof, eventually. Vykkish uses fear or lies to lure its prey into the dark, it is a predator that feeds on terror. The deeper, the darker the fear, the more delicious. Its ideal is self-preservation and the fulfillment of its boundless hunger for fear. Its only bond is service to the Old Crone (borrowed from Krow's legend); spawned by the Old Crone, Vykkish owes its life to her and hates her for that debt. But when confronted with true bravery, Vykkish cannot feed, is weakened, and can be defeated. The Boy Who Wondered "Your parents tell you," Old Haroun began, "to stay in your yurts at night. They tell you not to wander into dark caves, or the deep forest. But they will never say why, will they? And you wonder. Is it the beasts-- wolves? Tigers? Leucrotta? But do they ever mention Vykkish? "No? No, I suppose they wouldn't. But they should. There is the tale of the Boy Who Wondered, have you heard it? Well, I'll tell you. He wasn't much different than you. This was ages ago, when your people still lived in caves and had no written language. This boy was about your age, and he wondered why his parents feared the night. He asked, and much like your folks, they wouldn't say. And so this boy stayed awake one night. He waited until his clan were asleep and he sneaked to the mouth of the cave. "The boy sat and watched the bats that flowed out from the cracks in the mountain. He listened to the sawing of crickets and cicadas. He smelled the night-blooming flowers of that long-ago time. But he saw nothing to fear in the darkness. "Just as he began to tire, and his eyes began to close, he heard a giggle in the night. It was a small girl, he thought. His eyes focused and soon, in the gloom, he could make out a child. That girl was a stranger, though, perhaps from one of the valley tribes. But she wasn't frightened or starving. "The boy was fascinated. He had always imagined what it would be like to roam the night freely, instead of huddling in fear in their cave. The girl seemed happy and healthy. What could be wrong with playing? Just for a little bit? They couldn't be angry with him if he just stayed in the are, could they? And so he agreed. He walked to her. She smiled and began to play with him. They played for a long time, and it wasn't until he started getting tired that he realized they had wandered away from his cave. It was dark and he could no longer see the fire in the mouth of his cave. "It was only then the boy began to fear. But, he reasoned, he could just ask the girl to guide him, for she had found her way easily enough. He looked around, but she had vanished. All he could hear was her laughter from the darkness. The boy panicked, his breathing quickened, but still he figured he'd make it home when the sun woke up once more. "'But you'll never make it home,' the girl sang from the gloom, 'you'll die in the dark, alone and never be found.' The boy started to run, any way he could. The girl's laughter ever chasing him, seemingly from anywhere and everywhere at once. He ran, hurtling through the darkness, the shrubs tearing at his clothes, strange formless darkness closing in from behind. Always the girl's laughter following him. Hunting him. "The dawn came and the boy's parents found him missing. They searched, but they never found him. And now I see your parents coming. They'll scold me fiercely for frightening you. But if I have frightened you, good! Then maybe you'll remember to fear the dark and the thing that lurks behind it. You'll fear Vykkish, who feeds on children, who hunts in the night. And maybe you'll live to be old enough to tell your children." I wouldn't want to join any game that would have me as a player! 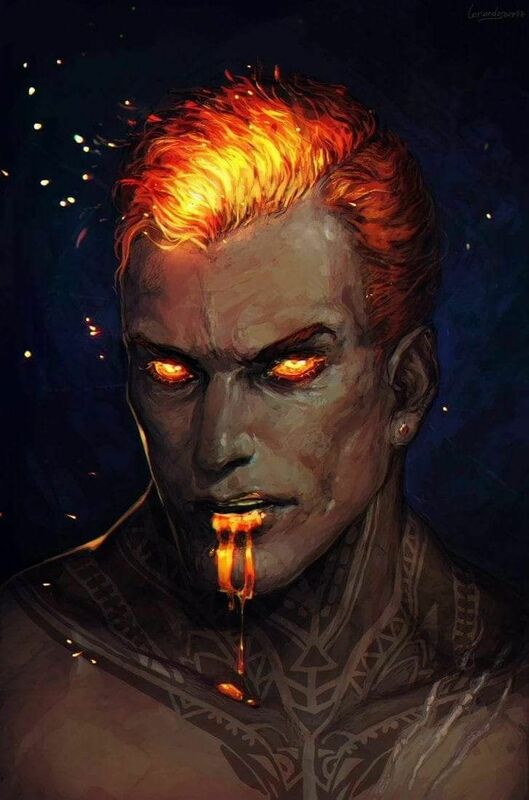 Surtur is a god with many faces but all of them share common threads, he is unabashedly passionate and puts his heart and soul into whatever it is that he has comitted himself too. In combat this translates as a fighter possessed with a fiery rage that will not be stopped until their opponents lie broken before him. However there is more to him than a fighter he is also a craftsman who places all of himself into everything he crafts. While this is mostly weapons, since Surtur believes that war is a form of poetry, he is also known to make sculptures or the occasional tool. In the end he is a capricious being of fire and passion a stalwart friend with a matchstick temper, fiercely loyal yet containing a prodigious wrath. To prove your loyalty to Surtur is to make a lifelong ally just as surely as crossing him will earn his prodigious wrath for all of time. Or until you are naught but ash. Ideals: Follow ones heart wherever it leads you and crush all those that stand in your way. "-and in the end Surt, the king of giants, will clash with the AEsir and when the last of them has fallen to his flaming sword then Ragnarok will end. His flames will take the world to be born anew from the ashes of his rage and when the final ember of Surt extinguishes the new world will ignite with life." "It is told that the craftsmen pray to Surtur to keep their forge fires strong and their hammers strike true and they pray to him earnestly and constantly. For it is known that Surtur is a temperamental god and to deny him your praise one day could be sufficient for his favor to abandon you." 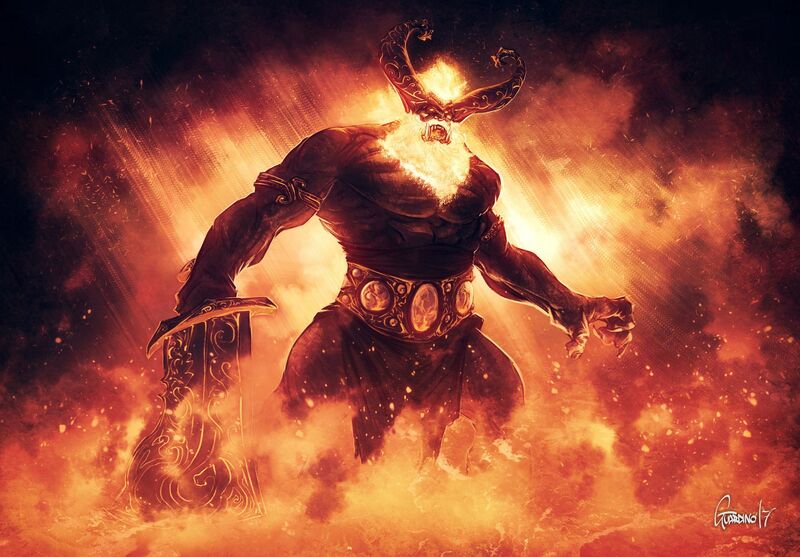 "Though he is primarily worshiped by the smiths and warriors of the fire giants there are those warriors of particular style that choose to give offerings to the god of fire and combat in hopes that he will bestow upon them the same strength that Surtur possessed when he fought and defeated thousands of frost giants alone. They pray he will infuse their hearts with passionate fire." "For hundreds of years the tale of Surtur and the world Snake has been passed down from tribe to tribe, generation to generation. It is told that Surtur fought the massive snake longer than the longest of rivers, he was a mountain of fire and fury. It was said the fight raged on for over a hundred years with the snake using every ounce of its speed and guile to outwit the giant but It could not withsatand the fury and power of Surtur who fought with all the passion of fire incarnate." Last edited by Tyrus34; 02-04-2019 at 03:15 AM. This sounds so interesting, reminds me of the Percy Jackson series! I would love to give this a try but as of right now, I don't think I can keep up with another game that posts daily. I wish everyone best of luck! Personality: Keadilan is a no nonsense individual of little humours. He has spent an eternity keeping his fellow deities to account, sacrificing much in his thankless task of ensuring no other deity oversteps the boundaries of the cosmic order. He is an entity of few words, instead spending almost all his time listening to that which others say, weighing their words. He never switches off, never rests, and is always judging every thought, word and deed of others. He finds it difficult to work with or relate to others, as inevitably he will be forced to pass judgement upon them one day. So, he struggles to form relationships with people on an emotional level. He is extremely pragmatic, and seems to be fairly incapable of understanding, let alone participating, in any sort of recreational activities. He is the kind of individual who never really 'switches off'. Keadilan is an avid listener and avoids the spotlight. If he is talking, then he is unable to truly pay attention to the thoughts, words and deeds of others. He cannot pass judgement upon people if he is not paying attention, and he cannot pay attention if he is the one seeking attention. Keadilan views all things upon a scale. He has spent an eternity weighing the actions of others, and so everything he witnesses is something he commits to an internal scale of good vs evil, order vs chaos. Keadilan is used to passing judgement on all entities, from the smallest beetle to the grandest of deities. He judges every action, all the time. 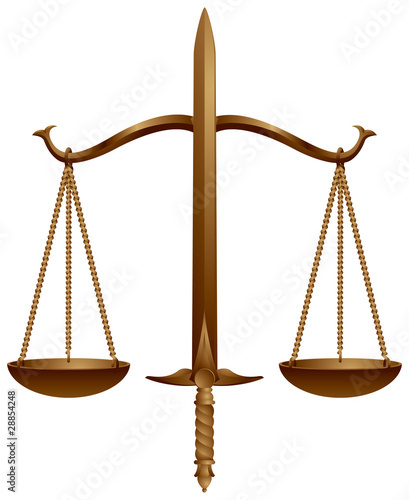 No one, be they god or mortal, is outside of the law. All will be judged by their actions eventually. Keadilan has no real bonds to anyone, as bonds insinuate a chance that impartiality might be compromised. The only thing Keadilan is bonded to, is the rule of law. Keadilan is unable to form relationships with others. He has empathy, certainly, as that is an important aspect in judging the actions of others, however he finds it near impossible to grow close with others. How can one truly pass impartial judgement on others, if they have an emotional investment? Keadilan does not believe they can, and so he usually keeps all entities at arms length, and is unable to relate well to people on any form of intimate level, be it friendship or anything more than that. Legends: At the dawn of time, when the Gods themselves first came into being, there was a long period of Chaos. New to their powers, with little understanding of consequence, the Gods spent countless millennia at war with one another, each trying to out do the other with grandiose gestures of creation and destruction. Worlds, planes and people were created and destroyed with reckless abandon, and there is no telling how many species were created meticulously by one God, only to be utterly exterminated by another in jealous rage. An indeterminate age passed when life was created and destroyed, purely on the whims of petty, spiteful Gods at war with one another. Seeing such a state, Morinion Keeper of Time and Master of Knowledge, foresaw a future where the Gods would achieve nothing, instead spending an eternity creating and then destroying everything. This could not be, for if the Gods were to truly flourish, then there needed to be something created that would endure, that would grow. If that were to occur, then the God's power must be kept in check, and so, Morinion began to look for one worthy of a power to keep not only the Gods, but all creatures, accountable for their actions. All entities, mortal and immortal alike, must be made aware of the consequences of actions. To that end, Morinion's eye turned to one young Deity, Keadilan. Son of the Sun God, Palladus and the Princess of Peace, Sinwe, Keadilan was a being with a keen sense of what was right, and as such had spent his entire existence trying to defend those who were at the mercy of fickle and spiteful Gods. By his efforts alone, countless worlds and races were spared the manic and orderless competition of the Gods. So it was that Morinion approached Keadilan, offering him the chance to ascend to a position of great power, one that would see him able to defend any and all he deemed worthy, and punish any and all who overstepped their rights, or encroached upon the rights of others. Keadilan, naturally, accepted without hesitation. To be certain that Keadilan's heart was true, Morinion asked that Keadilan sacrifice his sight. Without hesitation, Keadilan accepted the terms, even though he wondered how he would hold the Gods to account for their actions if he could not see what they did, be it to each other, or to the mortal folk. Morinion, being the master of all knowledge that he was, saw Keadilan's inner doubts, but also saw how they were put aside so that the young God might accept this new mantle of responsibility. Encouraged, Morinion raised Keadilan up from a minor deity serving the will of his father and mother, into a mighty God in his own right. He named him the Justicar, and declared that he would hold all beings accountable for their actions. Without his eyes, Keadilan was granted the ability to see with his heart, to know the true motivations of all, be they God or Mortal. Without eyes to betray him, Keadilan could weigh the motivations of all actions, be they grand or minute, and judge them without bias. Any being of all creation could stand before Keadilan, be they God or Mortal, and he would judge them without preconception or bias. Anyone who came before Keadilan's judgement would be truly equal, and thus, the judgement he passes upon them would be fair and just. Last edited by Arkaon; 02-04-2019 at 03:40 AM. are all players going to be from the same pantheon, in the end? Would they recognize one another, if that is so? I was wondering much the same unless that's something that will be fleshed out after applications close between those selected? Hello? (feedback noise) Is anybody else in here? I am, although that doesn't help us much. To the DM - your posted deadline has passed. Have you chosen your players?